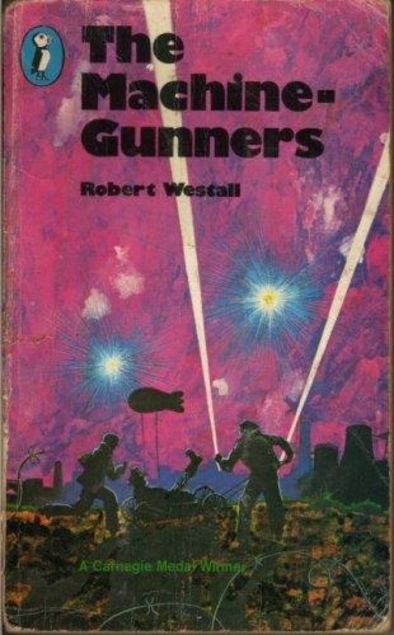 The Machine-Gunners by Robert Westall was first published in 1975 and it won the Carnegie Medal. We’re back at the Second World War in this book, the setting is the fictional town of Garmouth on Tyneside where the children were enthusiastically seeking out war souvenirs in the shape of spent machine-gun bullets, shrapnel and the tailfins from incendiary bombs. They’re vying with each other all determined to have the best collection. Chas McGill has the second best collection, the best is owned by the local school bully who takes great delight in bashing everyone up but of course he is really a coward. Chas hits the jackpot when he discovers the wreckage of a downed German aeroplane deep in a local woodland. With the help of some friends he manages to free the machine-gun from it and with the help of a tremendously strong mentally challenged neighbour they all set about building an underground shelter for the gun – which expands and expands until it’s a large air raid shelter. The children become adept at nicking anything they need so it’s a real home from home. In fact as one of them lost both his parents in a recent Tyneside air raid the shelter has become his home, the authorities think he also perished in the raid. At one point an escaped German prisoner of war stumbles across their hide-out and as they’ve somehow managed to jam the machine gun they realise that he can help them fix it. The prisoner is exhausted and ill and the children look after him, well they can’t turn him over to the authorities, he would tell them about their machine-gun. This is a great read which at times has elements of ‘Dad’s Army’ about it with the Home Guard featuring and local enemies being much more annoying than the German prisoner who isn’t at all like a Nazi, he seems like a decent chap. This book is very autobiographical, the author dedicated it to his father and mother who were the father and mother in the book. He says: The bombing raids on Tyneside during the despairing winter of 1940-41 were appalling and relentless and The Machine-Gunners is a tribute to the endurance, courage and humour of ordinary people in extraordinary circumstances. When we drove up north of Aberdeen for a few nights last week we had a specific goal in sight – a bookshop in Huntly that we had been told about by a friend. To be honest I was quite disappointed when I saw the shop as it’s really small, however I managed to buy a surprising number of books. 1. Continental Crimes Edited by Martin Edwards – a compilation of short stories, another in the British Crime Classics series. 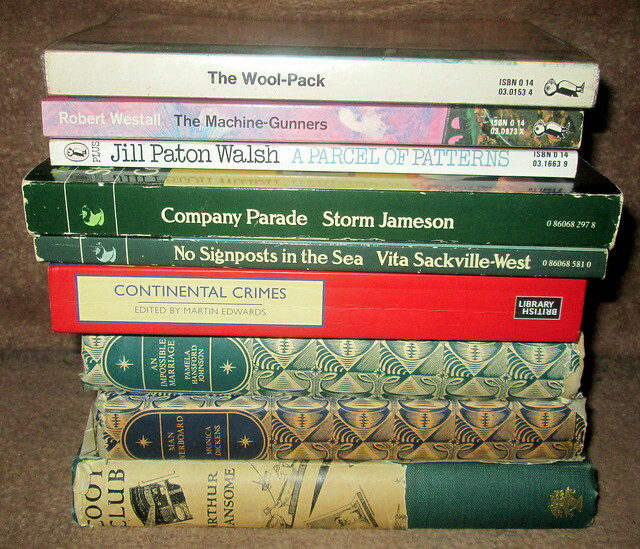 and three Puffin books – yes it seems that I have started a Puffin collection – sort of inadvertently.